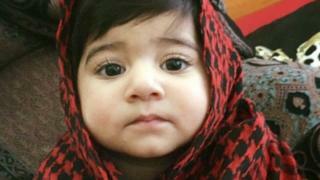 A woman accused of murdering her daughter told a relative that she put a pillow over the child's head, a court heard. Nadia Ahmed, 44, told the High Court in Glasgow that her sister-in-law made the confession in the days following the death of 14-month-old Inaya Ahmed. Sadia Ahmed, 28, denies murdering Inaya at the family home in Glasgow on April 17 last year. Nadia Ahmed told the court that she spoke to her sister-in-law in the kitchen of her home in Glasgow, where she lives with her husband and two daughters. She asked Sadia Ahmed what happened to Inaya. Prosecutor Paul Kearney asked Mrs Ahmed: "Did she answer you at first," and she replied: "No, she said it was between her and Allah.."
The jury heard that Mrs Ahmed kept asking what had happened. Mr Kearney said: "Did Sadia tell you something?" Mrs Ahmed replied: "Yes. She told me when she took Inaya upstairs to her bedroom she put a pillow on her face." The witness was then asked: "How did you feel," and responded: "I felt that my brain had become frozen." At this point Mrs Ahmed broke down in tears and the court was adjourned. Earlier, Sadia Ahmed's father-in-law, Afzal Ahmed, gave evidence at the trial. Mr Kearney asked the 73-year-old what had happened on the morning of 17 April last year. Speaking through an interpreter, he said: "Just before 11am, at about 10.50am, my wife was holding Inaya against her left shoulder. She was screaming and crying and she said: 'Sadia has killed Inaya.'" Mr Ahmed added: "I jumped off the bed and took Inaya off her and gave her to my daughter Shagufta." Mr Kearney asked: "How was Inaya?" and Mr Ahmed replied: "Her lips were blue and she was just like dead." Mr Ahmed also told the jury: "My wife woke me up. She said the baby was dead. I asked what happened and she said: 'Maybe Sadia was feeding her and she's not breathing and maybe in anger she killed her.'" Defence QC Ian Duguid said: "It seems likely your wife took a guess, do you agree?" and Mr Ahmed replied: "Yes, it must be a guess because she did not know." Mr Ahmed agreed that he was questioned three times by police and never told them about what he claimed his wife said to him.